Leather Collars offer from a very strong leather or fabric - nylon. They are almost indestructible, suitable for water in the snow, in harness, for sport, they can also be washed in a washing machine. 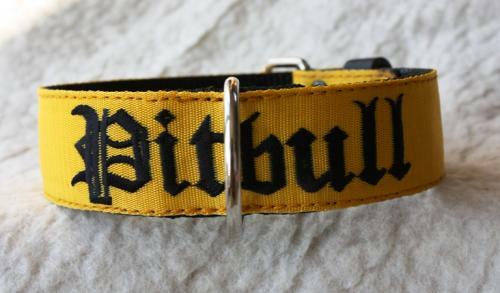 Collars are available in various lengths. Holes on the collar fittings are provided at the end of the collar is a metal tip. Choose between different colors and styles of embroidery and also the location of the ring. When ordering the collar must be reported to breed, age, neck circumference and clean dog. All listed prices is always vyobrazenému collar are therefore approximate. The exact price according to the assignment if it is different from the orientation, we will always tell you then e-mail and we will wait for your approval. 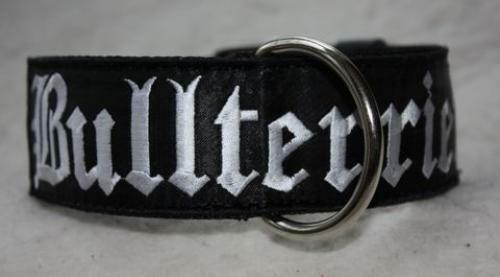 Nylon collar with name and phone number, 3 cm wide.